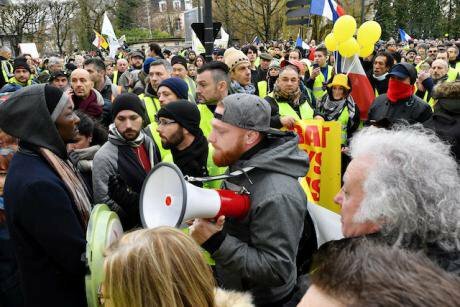 Yellow Vest demonstrators in Bourges, France, January 12, 2019. ANDBZ/Press Association. All rights reserved. My wife and I used to live in West Brittany. Like Connemara it’s a beautiful place if you can afford it. After the effects of the 2008 crisis began to be felt, my work as an independent educator dried up. Banks and institutions put contracts on a two-year hold. After an expensive eighteen months of wait-and-see, we moved to Nantes. Five years on we consider ourselves lucky to have escaped peripheral isolation and financial suffocation[i]. Peripherality is about spatial distance from work and social services. 75% of home-work trips daily in France are by car with an average distance of 50 kms. Without secure work, family ties or welfare protection you won’t make ends meet in Peripheral France. This was why we supported the first protests of the Gilets-Jaunes. The first Saturday protest in November mobilised 287,000. Most had never protested before. There have been eight Saturday protests. Over 5,000 were taken into custody and a thousand held in prison[ii]. Emmanuel Macron reacted by first, apologising, then freezing tax increases and bank charges while raising the minimum wage. Amazingly the Gilets-Jaunes won more concessions from the government than any trade-union or opposition party for decades. Paradoxically the more concessions Macron made the more the movement became radical. The moderate middle-class, unsettled by the level of violence, now stayed away on Saturdays. (For this alone it may be argued that Macron had played it this way.) Amazingly the Gilets-Jaunes won more concessions from the government than any trade-union or opposition party for decades. The current discord in France is not about immigration, but money and status. For decades successive governments have driven economic deregulation while distributing welfare to the bottom end of the social scale. The squeezed middle paid revenue and kept their lips shut (an estimated ten million people). This evolved alongside the isolation of suburban and rural spaces and resulted in the emergence of ‘The Two Frances’. Hiding this national social fracture has been ‘Europe’ – an increasingly unsure ideal fused indubitably with global neo-liberalism. Macron’s ambition for a post-national European sovereignty and a multicultural France is considered with suspicion in the poorer regions. Hyper-centralisation in the internet age and the fusion of regions into super-regions under François Hollande resulted in the dislocation of thousands of public servants. Income inequality and status depreciation in the face of new wealth have been the results. The current discord in France is not about immigration, but money and status. Two decades ago, the philosopher Marcel Gauchet warned that the greatest threat to multicultural France was that nobody had bothered to debate its effects on democracy[iii]. Today the country is a multicultural society but without a reformed democracy. That’s why ordinary people stand at roundabouts wearing fluorescent jackets: They want to be seen and what they are talking about listened to. They refuse any form of representation, which is their great strength and weakness too. Recently political scientist Pierre Rosanvallon described populism as ‘a political form that is, for the moment, the sole response to the problems we face in the world today’[iv]. This form uses bits from the Right and pieces from the Left to develop an incoherent narrative against the status quo. The first successful populist is Emmanuel Macron himself. His ‘start-up’ election and his positioning in ‘the centre’ was managed on a digital platform by a small core of friends from the Grande Ecoles and Tech corporates like Apple. Macron lacks such roots in regional France unlike all previous Presidents. His party LREM is an eclectic ferment of mostly better off middle-class executives. LREM constituency politicians are rigidly ‘whipped’ by Richard Ferrand, an ‘old dog’ of the Socialist Party’s tribal politics whose fiefdom is in Brittany’s heartland. Macron lacks such roots in regional France unlike all previous Presidents. He is isolated in the Elysée palace and so needs to win back trust (his IPSOS popularity rating dropped to 20% in December but so did that of all other political actors). Will the debate get consensus from the multitude of opinions to be expressed? What limits will be accepted, and what mechanism will record consensus? The dissolution of the traditional Right/Left party divide leaves the President in a rocky place. How will they take part in the national debate? Does it not undercut the agonistic role of the Assemblée Nationale? What limits will be accepted, and what mechanism will record consensus? The Yellow-Vests are a bottom-up, eclectic social movement. The debate will differ from those of the Italian 5-Star Movement’s digital platform that was managed top-down. The debate overseen by the State is between citizens and not between citizens and the government. This is a risky and complex proposition. Visionary, if it creates a new communicative civic space for the Twitter age. A debacle, if those well-funded lobby groups succeed in monopolizing the debate for their champions. Last weekend, I watched one of France’s popular chat shows hosted by Cyril Hanuna. Hanuna speaks his audience’s roughbanlieulanguage. For nearly two hours everyone gave their opinion about the arrest of a gilet-jaune champion boxer. He’d hit a CRS member in defence, he says, of a woman who was being beaten up. Why was the boxer hero of the gyspy community in custody while the cop who’d assaulted an arrested black protester was free? Over a hundred thousand euros were collected online for his legal fees. The debate was accompanied by phone videos showing poorly-trained police using rubber bullets indiscriminately. Once the President’s name was mentioned gross imprecations were hurled. Hanuna responded that incidents concerning the boxer and the CRS officer were not the same in the eyes of the law. But you wouldn’t think many in the studio accepted this constitutional distinction. For them the enemy was the power incarnate of the president-monarch. The security force is his lacquey. What’s dangerous for the great debate is having no red lines for this tribal cynicism and hatred for all authority. Despite this, Macron’s Great Debate should challenge French civic society to innovate and find ways to make people’s daily worries matter. Already there have been the usual blunders that have eyes thrown to heaven. The first coordinator Chantal Jouanno prompted understandable outrage at her 14,OOO euros monthly salary. The debate will be organised at local commune level with a procedure for individuals and civic associations to speak at scheduled meetings. (For those interested you’ll get details in French here). In one of the first surveys carried out, one in two French citizens want to participate[v]. The stakes of the debate are very high both for Emmanuel Macron and for French democracy. The rest of Europe will be watching and hopefully learning from its results. [i] The geographer Jacques Lévy has spent a lifetime exploring territory and mobility. These essays provide an overview of what a just or equitable territory is. [ii] This Wikipedia site gives stats and details. [iii] See this conversation between Marcel Gauchet and Régis Debray back in 2002. [v] Opinion Way Survey, 14/01/2019.